Port Moresby (EMTV): Australian Chief of Australian Defence Force, General David Hurley made an appearance at the PNG Defence Force Headquarters at Murray Barracks in Port Moresby. General Hurley is in the country for a three-day visit, to discuss strategies that will strengthen the PNG-Australia partnership through various defense programs. General David Hurley was met by Papua New Guinea Defence Force Brigadier General Francis Agwi. Military personnel at the barracks assembled at the Commanders Parade Ground to welcome the visiting general and his delegate. General Hurley’s visit follows ongoing talks with the PNGDF and the PNG government on enhancing the PNG Defence Force’ capabilities. These will be achieved by building the PNGDF’s capacity through joint partnership platforms; one of which is the Defence Cooperation Arrangement. The arrangement will be used as a framework to deliver PNG’s Defence Cooperation Programs valued at an estimated 27 million Australian dollars. 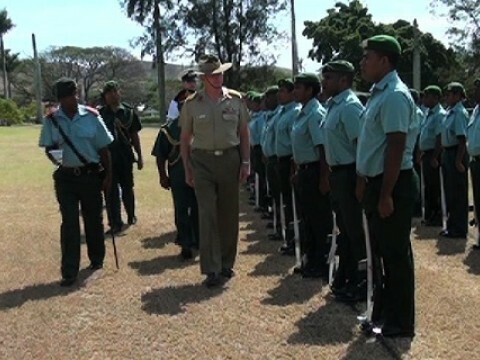 General Hurley travelled to Wewak today for a one-day visit to the Moem Barracks. He will also visit the Bomana War Cemetery before he departs for Australia on Saturday, August 3rd.